Way back in the 1960s, the Madhya Pradesh government started dictating what a farmer must do; what they will sow, by how much and which farming practice to follow. Its main intention was to bring about agricultural industrialisation. And it probably has achieved its objective. The government claims that the contribution of agriculture to Gross State Domestic Product (GSDP) has reached 29 per cent. An analysis of the government data shows that the agricultural growth of the state was 3.13 per cent in 2005. It registered a negative growth between 2007 and 2010. Then in 2011, the state took a giant leap, and registered 18.9 per cent agricultural growth. The growth continued in 2014 and 2015 despite severe droughts and floods. Government statistics show that food grain production increased by 222 per cent between 2006 and 2015; fruit production by 200 per cent in the five years preceding 2015. Vegetables, spices and milk also registered a similar growth. This is impressive because 65 per cent of agriculture in the state is dependent on the monsoon and drought hit most parts of the state nine times between 2002-03 and 2015-16. But notwithstanding these figures, some 1.59 million farmers relinquished agriculture between 2001 and 2011. The number of farm labourers increased by 4.79 million during the period, Union agriculture minister S S Ahluwalia informed the Rajya Sabha on November 18, 2016. Likewise, the state witnessed a total decrease in livestock by as much as 2.31 million between 2007 and 2012. Worse, loans incurred by farmers increased significantly. In December 2015, loans disbursed by banks to farmers in the state stood at Rs 60,977 crore; the amount increased to Rs 81,228 crore by the end of 2016. However, small and marginal farmers received only 11.33 per cent of the total loan amount. This often forces them to depend on private moneylenders. The question that stares us in the face is why the state’s rising agricultural production has failed to accrue any benefits to its farmers. To understand this, let’s consider the production figures and prices of a few commodities in recent years. In 2015-16, Madhya Pradesh produced 1.33 million tonnes of pulses. It increased by 67.67 per cent in 2016-17. The production of oil seeds increased from 5.02 million tonnes to 7.78 million tonnes during the year. The result was that the market price of these produces crashed. Prices of tur or arhar dal (pigeon pea) and moong dal (green gram) halved. Farmers could not recover the production cost, let alone make any profit. A bumper crop led to their destitution because the state’s market system and price fixation policy have not been in sync with the growth in production. For instance, in 2013-14, the state government did not procure two-thirds of the wheat produced. Consequently, farmers were forced to sell the crop in the open market at Rs 1,250- Rs 1,350—much lower than the minimum support price (MSP) fixed by the government every year to ensure that farmers get a “fair price” for their produce. This year, the government has fixed MSP for 100 kg of moong dal at Rs 5,225 and that for tur dal at Rs 5,050. But in June the pulses were being sold at Rs 3,800 and Rs 3,500- Rs 3,600 at Guna mandi. It happened so because the government falls into slumber after announcing MSP. It does not engage itself in buying, and leaves the field open for the arhatiyas (middleman traders) to form an illegal cartel and purchase pulses from farmers at a cheap rate. Following the recent farmers’ agitation, the state government announced that it would procure moong, tur and onion. But by then, farmers had already sold bulk of their produce in the open market. Now, it is the arhatiyas who will sell most of the commodities to the state government and earn “more-than-the-fair price”. Digitisation of financial transactions has further affected the farmers. Post-demonetisation, remittances to them have virtually stopped. For instance, at Guna mandi, where arhatiyas trade with 50-60 farmers every day, some 20 agents were completing the Real Time Gross Settlement (RTGS) Forms (electronic payment system that allows individuals to transfer funds between banks) for about 1,000 farmers in May. However, the banks declined to accept forms in bulk, and the farmers suffered because of delays in receiving their own money. Consequently, the mandi remained closed for four days in the first week of June. Now consider the other announcement made by the government following the farmer unrest. It has said that farmers will be remitted 50 per cent of the transaction amount in cash. While the order sound impressive, the fact is some mandis have to disburse an outstanding remittance of Rs 60 crore to farmers. But banks in those mandis do not have more than Rs 6 crore in cash. Besides, the Income Tax Act prohibits remittance of more than Rs 2 lakh by cash. Then how has government taken this decision? Another major contradiction pertains to the cropping area, which registered a 20 per cent increase between 2001 and 2015. However, during the period the average farm landholding reduced from 2.2 ha to 1.78 ha. The number of farmers also decreased from 11.04 million to 9.84 million during the period. We should not consider this as development because farmers have been converted into agricultural labourers. While all these grievances have culminated in the farmer unrest in the state, does it really represent the voice of the destitute? As per the National Sample Survey Office’s (NSSO’s) April 2006 report, 70.8 per cent rural families in the state depend on agriculture. On an average, total monthly income of a family is Rs 6,210. Of this, Rs 4,016 comes from farming. But this is not true for all. The monthly income of a tribal family is Rs 4,725 of which Rs 2,002 comes from farming. For a Dalit family, Rs 2,607 of the Rs 4,725 monthly income comes from farming. However, in agriculture-dependent Other Backward Classes Rs 5,534 of the Rs 7,823 monthly income comes from farming. While the agitation should not be looked at from the perspective of social classification, it is important to know that this agitation is comparatively led by bigger and powerful farmers. 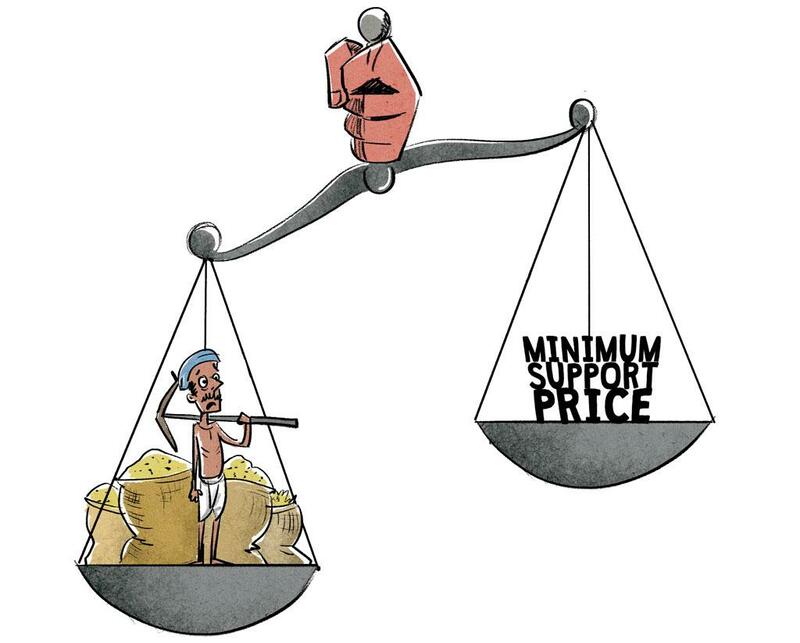 At present, small and marginal farmers are not at the centre of the stir. The districts that are witnessing the agitation are known to be the major producers of wheat, mustard, maize, soybean and cotton. It appears that the expansion of areas under cash crops has heightened the crisis so much that “farming under the economic development model” has placed farmers at the brink of being ruined. Mandsour, the epicentre of the stir, is known for highest mustard productivity and ranks third among the soybean producing states. Whatever be the case, farmers must receive reasonable price for their produce. Going by the NSSO report, a farmer earns Rs 4,016 a month from farming. If he worked as an unskilled worker, he would earn no less than Rs 6,600. Thus there is an urgent need to implement the M S Swaminathan Commssion report, which recommends that farmers should get 50 per cent more than the cost of production. The government should also procure commodities in a practical manner and not limit it to wheat and rice. The power supply for irrigation should be appropriate and at reasonable rates. It should also make seeds, fertilisers and pesticides available. Over the past 15 years, private companies have monopolised these inputs. These are important so that farmers are not labelled as defaulters.